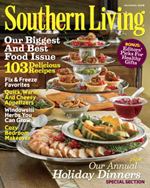 It's A Mystery has been featured in Southern Living Magazine. Please click here to read the article. "I wanted to tell you what a fantastic performance you and the "It's A Mystery" troupe did for the Aventis group! I have been singing your praises ever since." "We are certain we can speak for everyone who witnessed your "Motivation for Murder" when we say that your performance was truly enjoyed and definitely exceeded our expectations. I can even truthfully say that it was the best performance I have ever seen of a murder mystery." "Thank you for a delightful evening of entertainment! You all were truly crowd pleasers." "Talk about a successful evening! Everyone appreciated the format change and the fresh idea of a dinner theater.you are really a professional, first class group, and we are glad to have the chance to share an evening with you." "The entire evening was amazing. What impressed me the most was that you were able to weave in facts about our group - names, what we do, our personalities - after speaking with me for just a few minutes prior to the show. You made each "factoid" fit into the story line seamlessly. The personalization really made the dinner "ours" - that was great! ~ Trisha D. Simpson, Manager, Global Data Standards, Schwarz BioSciences, Inc.
"It's a Mystery - Dinner Theatre. Buyer says it was the one of the most successful nights in the history of the club. She gave Marjorie and her crew an A++! A "can't lose" type event for your cc's, etc. Marjorie will make you a hero. And - make it easy for you." "The client Betty Jones, left me a message on Saturday morning saying that when she & her husband arrived home, their phone rang off the hook with guests raving about the Murder Mystery!!! We should receive lots of press from her spreading the word in town!" "The next day the group was still talking about the fun they had. Thank you for coming and I hope that will not be the last time that I get to see y'all perform (smile)." "People were still commenting on the show the next day and how much fun it was. I appreciate all your work - it certainly helped me look good, and I will certainly recommend you to anyone looking for a different type of entertainment." "Thanks for the amazing performance last night. You helped make our fundraising event a huge success! The caliber of the performance, as well as the format, was a huge improvement over the group we hired last year for our murder mystery fundraiser....you were worth every penny!" "Thank you so much for a wonderful evening. I’m glad I got to experience a Murder Mystery put on by your group of wonderful professionals. I look forward to referring you to prospective planners in the future." I wanted to take a moment to thank you, Will, Wiley, Knowie, Bookie, Scarlett and Frank (that’s the way we’ll always remember you). Our employees had a blast last night. They all came in this morning talking about how much fun the event was. You and your cast did an amazing job; the personalization was awesome. You exceeded all expectations for entertaining us. Thanks again! !